On September 13, 2019, the School’s community will gather to celebrate its 50th anniversary with a day of events. This will include an open house at the Friedman Building, where guests will be able to tour the upgraded facilities and spend time meeting with faculty and reuniting with alumni and practitioners. 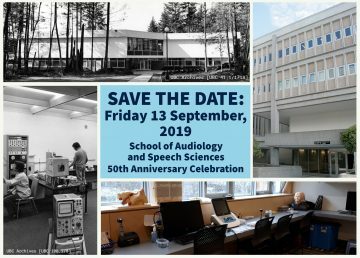 Later in the day it will include a poster session, discipline-related lectures by eminent scholars, and a gala dinner with entertainment at UBC’s new Robert H Lee Alumni Centre. School founder John Gilbert will be in attendance and give a brief history of the School. All alumni, faculty, clinical faculty, students, and staff are welcome. A full schedule and online registration will be available soon! Keep an eye out on our 50th anniversary webpage for updates!